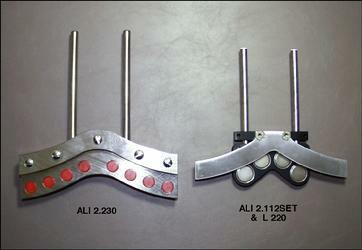 Like New ALI 2.112 Magnetic Bracket Set. Like New ALI 2.112 set Magnetic Bracket Set in Plastic case, consisting of 2 magnetic brackets (with 4 magnets) and 4 support posts Make Offer set of 2 brackets. The set is for use with all Prüftechnik AG laser systems - Rotalign All, Optalign All,, Masterlign, smartALIGN, PocketAlign & Turbalign series. 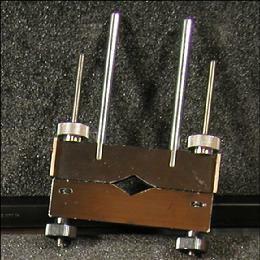 L 586 M3 bracket sensor holder for the Optalign Plus series sensor at - Make Offer. One only available! 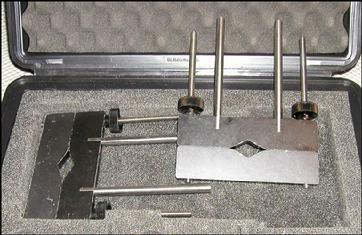 New M3 Bracket System for sale - Make Offer. Note that the Rotalign sensors and the LT 300 Alignment Simulator that the M3 Bracket set is mounted on are not part of the sale. Please click on picture to enlarge. Please specify set number L 580SET for a Rotalign series or set number L 585SET for use with a reflected beam series system – Optalign smart etc! Note: This is the last M3 Bracket System we have so give us a call @ 704-233-9222 or Email us for a Quotation! Note that Rotalign sensors and the LT 300 Alignment Simulator that the M3 Bracket set is mounted on are not part of the sale. All of the following brackets (and more) can be used with any of our Rental systems – or your orn Aligneo�, Optalign® series, Rotalign® series, smartALIGN�, smartSCANNER� or ShaftALIGN® systems. If you do not see a bracket or bracket component that you need to purchase or to rent with our system please call 704-233-9222 or send us an email. 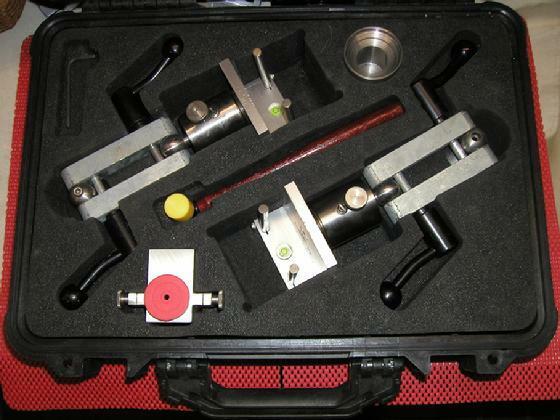 Used LUD 2.109Lset Narrow bracket system, 5/16" thick for shaft diameters up to 3-11/16" (for 2 sides), two brackets - including plastic carrying case Make Offer. These brackets can be used with any of our systems - the Optalign� series, Rotalign� series, smartALIGN�, smartSCANNER� or Masterlign� series systems. Comparison between the ALI 2.230 Magnetic Sliding Bracket assembly shown above and a single ALI 2.112 Standard Magnetic bracket with an L220 Stationary position adapter (Sliding Wing) mounted. 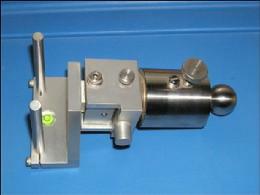 Note: The ALI 2.230 Magnetic Sliding Bracket assembly shown is not available for rent. 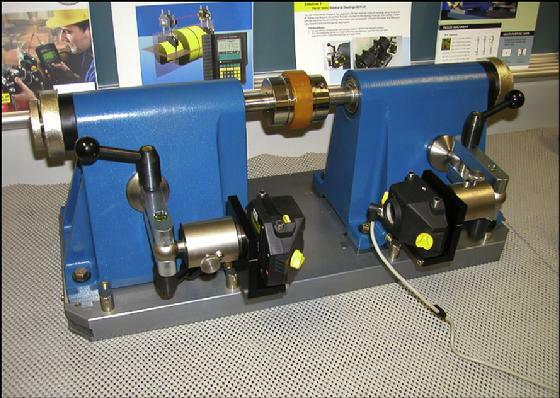 Both arrangements shown to the right allow measurement and alignment to be performed when one shaft cannot be rotated. 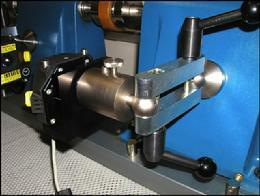 (Or when both shafts cannot be rotated – if you have two assemblies.) If you already are using a ALI 2.112set Standard Magnetic bracket set – request an L220 Stationary position adapter (aka Sliding Wing) to be able to use the combination on a non rotatable shaft. These Offset Support Posts are very useful when there are clearance issues for the laser system sensors and can be used with the chain or magnetic brackets. The Offset Adapter is very useful when there are clearance issues for the laser system sensors and can be used with the chain or magnetic brackets. Download a M3 Bracket Slide Show! 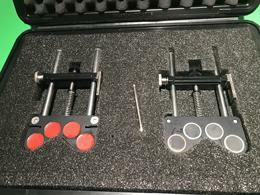 This Straightness fixed bracket set is designed primarily for use with the Rotalign® Pro and Rotalign® Ultra Systems and is used in performing X and Y axis Straightness measurements! All Rotalign® Pro and Rotalign® Ultra systems have optional Straightness firmware available through your local Prüftechnik AG Distributor. If you have a Rotalign Pro it already has the Straightness firmware installed but in the demonstration mode. The Rotalign® Pro Straightness firmware demonstration mode will allow you to take five measurement points along a straight line – at a maximum distance of 60 inches. The full version on both platforms will let you do what you need in measurement points and in length! If you take a few minutes to try out the Rotalign® Pro's demo firmware already installed on your Rotalign Pro system you will want one of these bracket sets! There is a problem though as we only have one set at the price shown below! 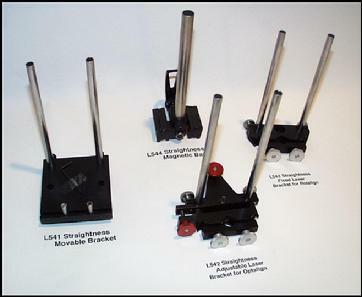 One (1) L 540SET Straightness fixed bracket set consisting of: L 541 straightness movable bracket, L 543 straightness fixed bracket and L 544 straightness magnetic base, including plastic carrying case. As a bonus we are including a L 542 Straightness adjustable bracket for the Optalign® Plus or Aligneo® Reflected Beam systems! This package is being sold for less than half the current selling price at only $815.00 USD! Important: Only one set is available at this price! Our extremely popular website is seen worldwide so if you want this set – do not hesitate! Need a Quotation on these brackets call 704-233-9222 or, send us an email! Note: The Optalign® Plus or Aligneo® systems can also be used to check Straightness utilizing an Excel Spread Sheet. If you have any Firmware Questions contact your local Representative or Distributor as we are not selling firmware any longer!